And what of the land itself? It is a place where the sun shines 280 days a year on average, a place of rich earth and an astounding bounty of fresh fruit and vegetables, a place of open and welcoming people. And it is a place we have been granted a glimpse of as we arrive at the Macedonian Embassy in Tokyo, to partake of a sumptuous meal prepared by Ambassador Cvetkovik’s mother Shekerina. 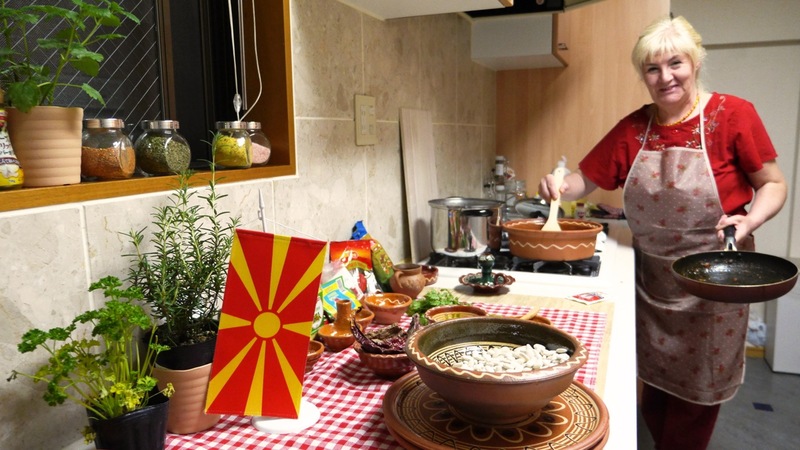 “In Macedonia, if some guests come to your house, you do your best to prepare food, to serve the guests… it is part of our hospitality.” she goes on to say. That’s right, Ambassador Cvetkovik’s mother made her first plane trip to this far-flung land to present a truly genuine Macedonian meal of the highest quality. Macedonians, we learn, feel deeply responsible for putting an absolutely delicious homemade meal on the table when a visitor is in the house. And we’re beginning to understand exactly what that means here today. And we’re surprised once more when we hear exactly what went into making all the dishes crowding the table here today. 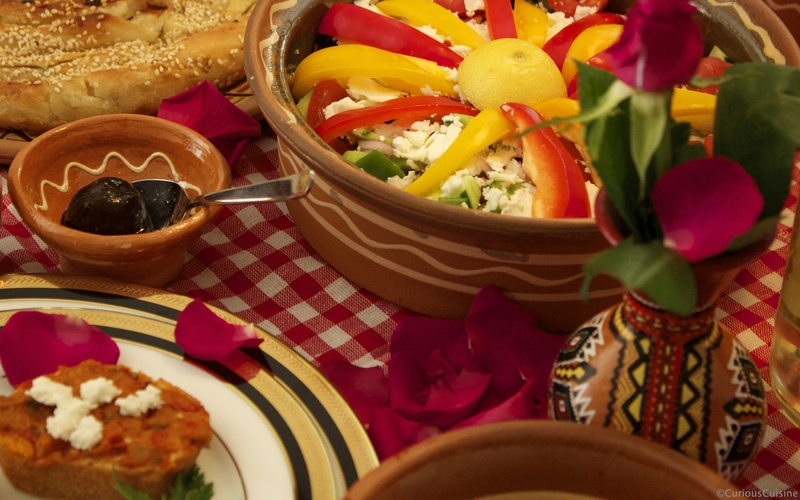 Everything is made from scratch, meaning Macedonian home cooking takes time and tremendous attention. It is early afternoon, sunshine warming the garden and patio outside the dining room, the table draped in a red checked tablecloth and virtually sagging under its load of earthenware dishes. A miniature Macedonian flag, with its yellow sun on a deep crimson background, adorns the centre of the table. Absorbing the scene we feel the giant metropolis of Tokyo receding, replaced by the ambience of old Europe, warm and comfortable. And then Shekerina reappears, smile like sunshine, bearing the finishing touches for the table. Before we eat, however, there must be a toast. 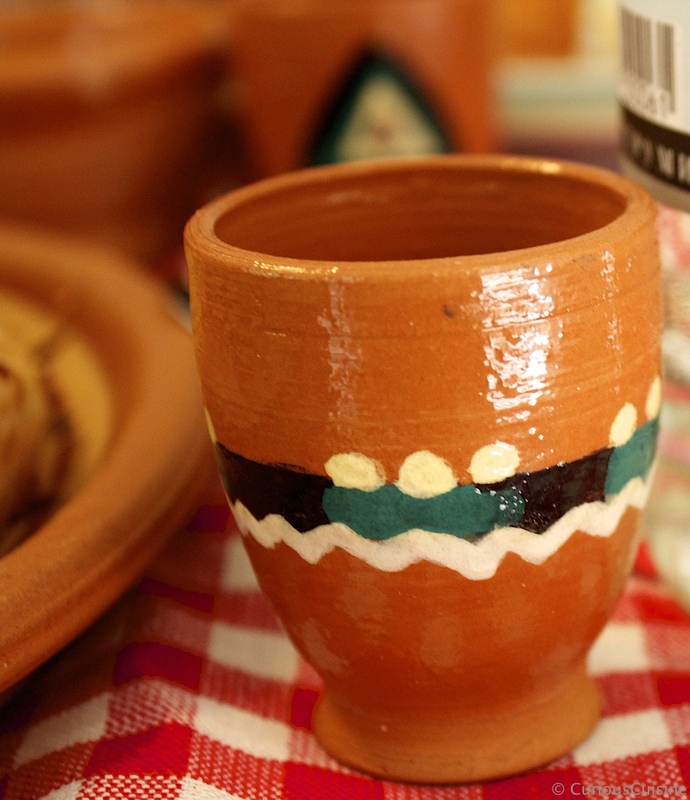 We raise small earthenware cups of a clear liquor called Rakia, which along with wine is traditionally made at home in Macedonia. Making Rakia is apparently not complicated, but it needs long experience and care to make a truly good product, traditionally drunk with a “meze” appetizer course. 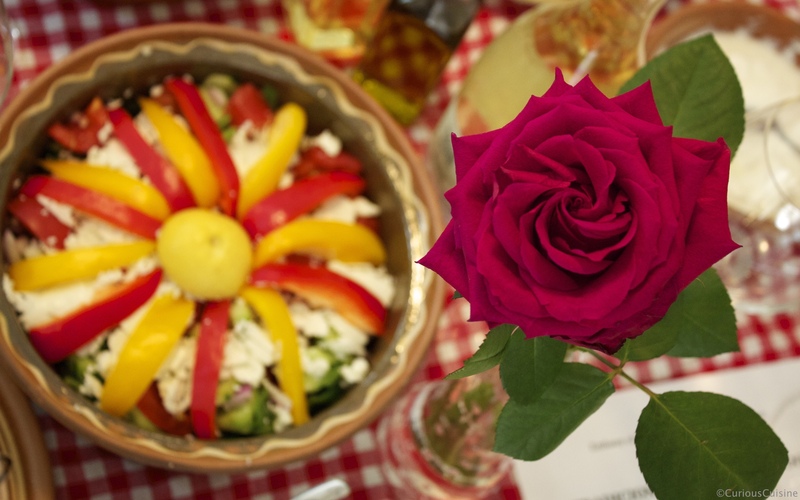 The first meze dish we try is a common Macedonian salad called Shopska Salata, topped with sliced peppers branching out from a sliced lemon in a sun pattern. 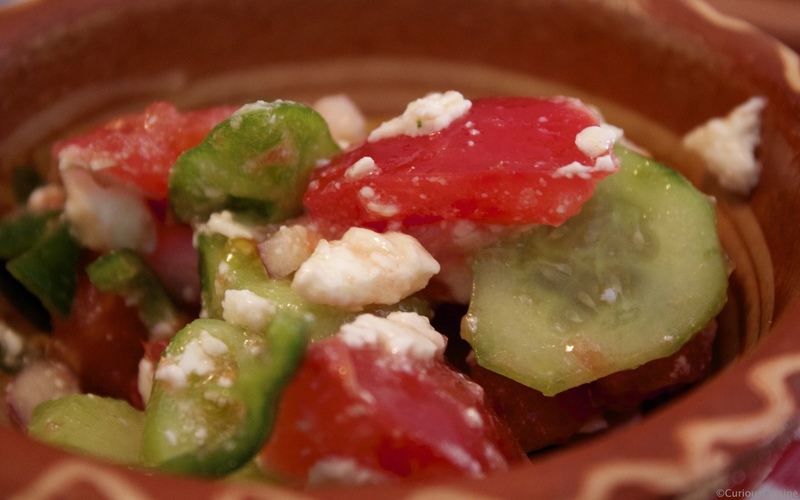 Beneath it is a mix of tomato, cucumber, purple onion, and Macedonian feta-like cheese brought to Japan by Shekerina. The lemon is squeezed over the salad, followed by a drizzling of olive oil and a dash of salt and pepper. Mix, and it’s done — supremely simple and wonderfully fresh tasting. The cheese is something of a discovery, far less salty and far milder than the versions of feta we’ve had before from different countries. And it makes up one very satisfying note in the overall flavour of the salad, itself truly invigorating on such a day as this, with the sun shining, all the windows open and a gentle breeze blowing in from outside. It feels healthy, reaching every corner of our bodies. 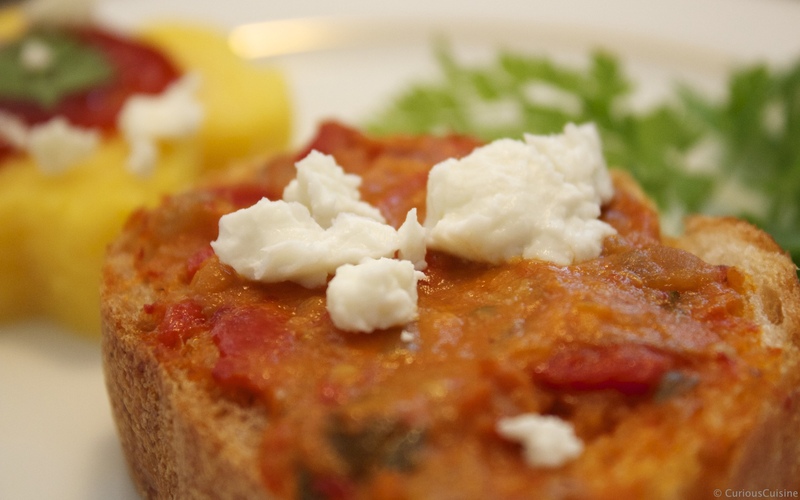 The appetizers or “Meze” continue with Kachamak, similar to polenta and topped with more of that crumbly feta cheese plus yoghurt — a lively mix of richness and smooth sourness that compliments the hint of sweetness from the cornmeal perfectly. The texture, too, is like nothing we’ve ever experienced before, an interesting mix of smooth and chewy with little grains of cornmeal. Another revelation is the roasted paprika paste called Ayvar, here spread over sliced of bread. Ambassador Cvetkovik tells us that after the peppers are roasted, they’re peeled by hand and then set to simmer slowly down to this lovely smooth consistency. The flavour is deep, rich and immediately pleasing, the sultry smokiness of the roasting process filling the entire mouth. Ayvar is apparently traditionally made in many Macedonian home around the end of summer as a winter preserve. And it’s a tremendous undertaking. Some 30 kilograms of paprika produce just 10 jars of Ayvar. Every autumn, neighbours gather together in a festival-like mood to make enough Ayvar for everyone. Also, the ambassador says, even the staff at the foreign embassies in Skopje get into the act, and diplomats have been known to take some of the homemade preserve back to their home countries. Just making the stuff in such a relaxed community atmosphere sounds like a lot of fun, and the taste is like nothing we’ve had before. Still absorbing the pleasures of the meze, we move onto a pair of mains starting with Tafche Grafche, a dish of Macedonian white beans that is the country’s national food. It was prepared in the earthenware dish it comes in, baked for hours, and yet the beans have retained their shape and firmness – a minor culinary miracle that apparently requires a special technique not just to get the texture right but also the taste. And of course the beans aren’t just from anywhere; Tafche Grafche simply doesn’t taste right if not made with beans grown in Macedonia, and these ones were brought special from home by Shekerina. We understand this determination to use only ingredients from the same place as the dish originated, this desire not just to replicate the thing, but to make the thing itself. After all, even when it comes to something as simple as a bowl of rice, its tastiness is very different in every country. 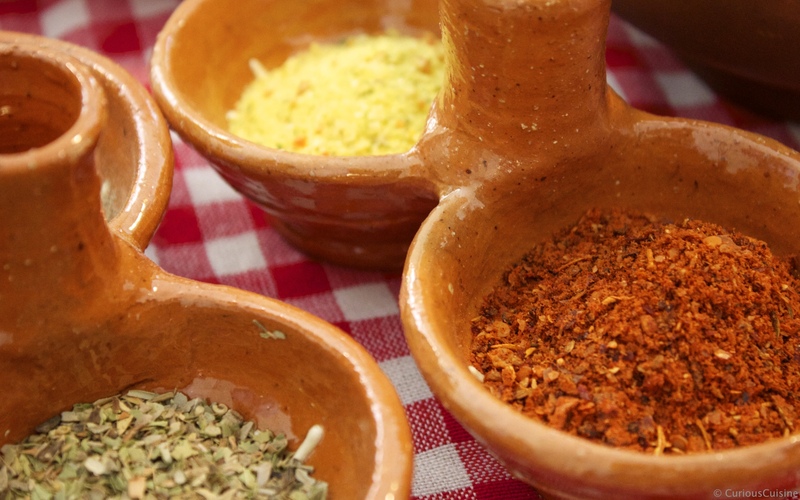 The flavours of dishes change completely depending on the types of ingredients or even where they were grown, plus the local tips and years upon years of traditional wisdom that goes into cooking them. Water, weather and the soil itself all impart their subtle accents to our foods, like “terroir” for wine grapes. As for the Tafche Grafche, its combination of slow-cooked beans, paprika and spices tastes somehow homey, though we’ve never been to the country where the dish was invented. The flavour is deep and round, warming and satisfying. 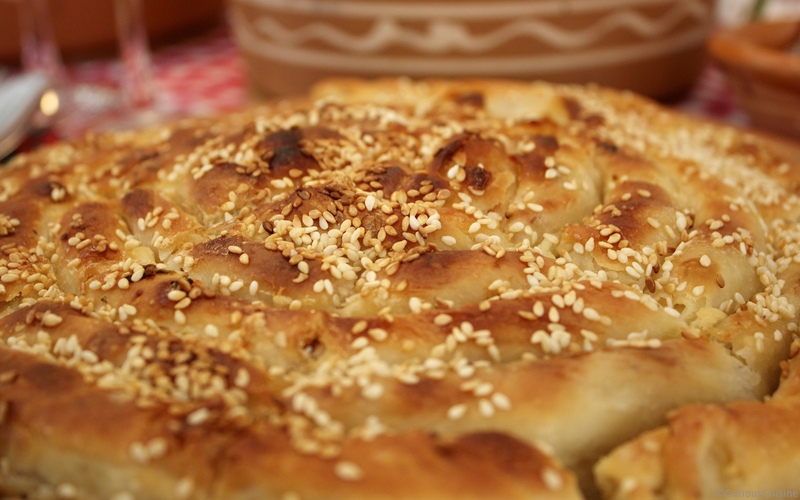 The second main dish is another creation we’ve never seen the likes of before, a large, coiled pastry filled with leek and sauerkraut called Vrtena Pita. We’re each served a very serious portion of coil, vegetable richness wafting up to us. Slightly crunchy on top and soft inside, the finely layered pastry skin is apparently very hard to make. We eat quickly, unable to disguise our enthusiasm. Smiling appreciatively, Shekerina disappears into the kitchen, emerging a minute later with a whole other Vrtena Pita and sets to slicing seconds. This dish is undoubtedly complicated to prepare, and she has made two for us, just in case. What tremendous hospitality and detailed consideration, from the choice of ingredients to every corner of the table. It is just as Ambassador Cvetkovik said earlier, that homemade food is the ultimate expression of Macedonian hospitality. This entire table is proof positive this is true. But we’re not done being surprised. This kind of thing is, the ambassador says, completely natural for a Macedonian, and the warmth and hospitality only grows the deeper you go into the countryside. And you don’t have to be a foreigner to get this kind of treatment. 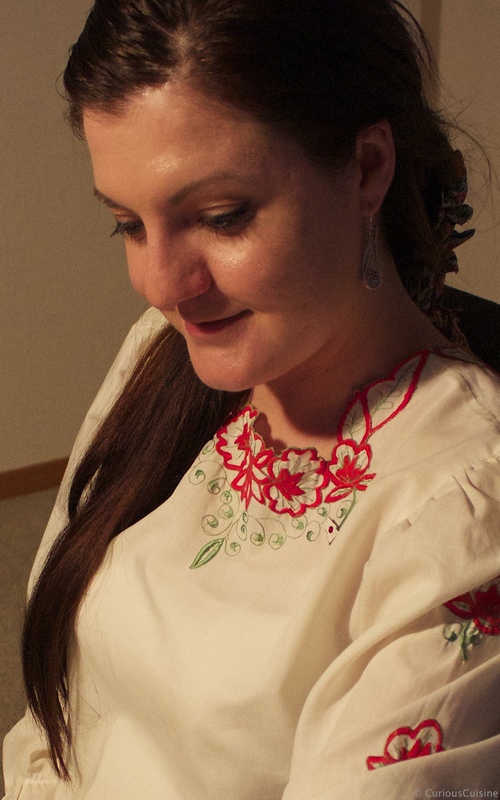 “They will be nice to you even if you visited from different cities” in Macedonia, she says. ”You will be surprised if you visit Macedonia,” she goes on with a touch of pride. Listening to this, and the stories of how Macedonians have held to their long traditions of hospitality and openness, we see hints of their true warmth and openness. Macedonian households all have a patron saint day, and for the three days around that day the family prepares the celebration dish for that saint, opens their home and shares the feast with anyone who comes in. Ambassador Cvetkovik says that, though originally religious, this tradition has become more of a happy celebration of hospitality and a show of respect for all who visit. The mains done, dishes are cleared away and replaced with plates of sweets, made of course by Shekerina. There are crescent- and flower-shaped butter cookies called Gurabii and Vanilici, both soft and simple but delicious with dabs of homemade jam on top. We also delight in the chocolate-banana cakes. 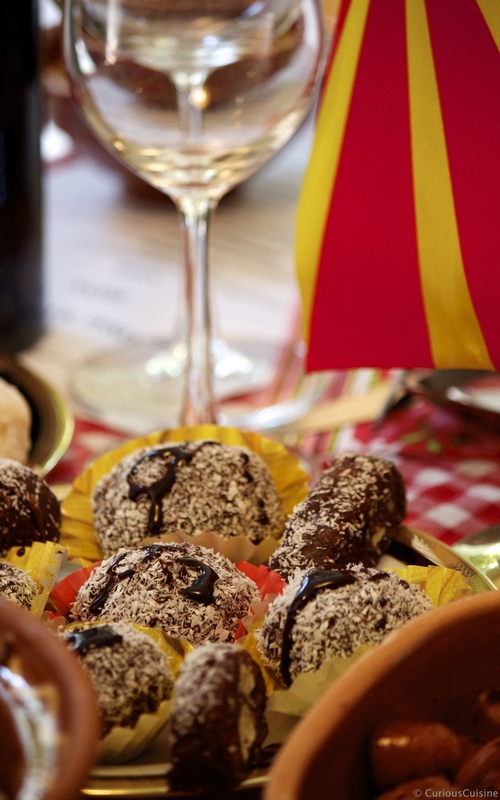 As we eat, we ask our signature and deceptively simple question: What do you like most about your country? Ambassador Cvetkovik answers quickly — the country’s immersion in nature, and the kindness of the people. Considering all we’ve seen, heard and tasted today, we might have guessed. “If you are lost … you will meet kind people to guide you, to help you, to make you feel… at home.” There are no barriers, she goes on. That reminds us of a talk given by one of the world’s most famous chefs. He spoke passionately about the delicious Macedonian tomatoes he ate as a boy, and about the wonderful flavours of all the locally grown produce. Tafche grafche. See Ambassador Andrijana Cvetkovik’s recipe. And Ambassador Cvetkovik takes inspiration from this simple philosophy. What things we continue — or don’t continue — has a major impact on what happens as we move forward into the future. You might call that an obvious statement, but then it’s something that human beings seem to forget easily. It’s also something that Macedonians seem to truly understand. That spirit appears to abide deep within Ambassador Cvetkovik’s heart. She goes on to wonder aloud if, when it comes to failing to meet goals, the biggest reason is simply giving up somewhere along the way. Just forging ahead makes a lot of difference. Eternal Macedonia. We would surely love to visit this country we’ve heard so much about today, with its history, its sunshine and landscapes, its people with such warmth and generosity in their hearts. And as we say our goodbyes, we are deeply thankful for this wonderful encounter, here on this warm day on the edge of summer, in this little corner of sprawling Tokyo.